Google Forms is a tremendous tool for organizing and automating digital quizzes. 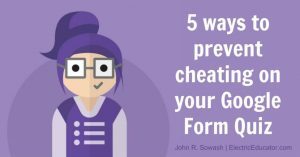 Here are five tips for designing “cheat proof” Google Forms! When asking a multiple choice question, click on the “snowman” to find the “shuffle option order” feature which will randomize the order of the answer choices in your question. Shuffling answer choices will make it more difficult for “screen creepers” to copy answers from a classmate. Add sections to your quiz to prevent students from previewing a form before class. This is a common problem if you post your quiz through Google Classroom to all of your sections early in the day. You can take this a step further by adding a “password” to your form to prevent students from moving ahead until you are ready. Google Forms doesn’t have a question bank feature to create different assessments for each student. However, you can create a similar experience by creating a branched form. First, add an un-graded multiple choice question in your quiz: “pick a number”, “pick a color”, etc. 4. Prevent cheating by asking better questions! Don’t limit yourself to multiple choice questions. Consider some of these other options: sequence questions, matching questions, reading passage, video question, image question, and free response / short answer. Locked quiz mode is one of many tools you have to protect the integrity of your assessments. When used in combination with the tips above, you have done your part to protect the integrity of your classroom quizzes. Locked mode prevents students from accessing external resources while taking a quiz. Their tabs, extensions, chrome apps, and screenshot functions will be disabled during the duration of the quiz. The information for this post was taken from an article by John Sowash in TECH & LEARNING, follow this link for the complete article and more details with examples.